Syncard : Each film coated tablet contains Atorvastatin Calcium Trihydrate INN equivalent to Atorvastatin 10 mg & Amlodipine Besylate BP equivalent to Amlodipine 5mg. 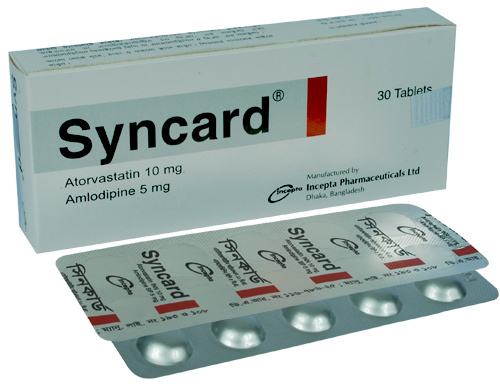 Syncard is a combination of two drugs, a dihydropyridine calcium antagonist amlodipine (antihypertensive/antianginal agent) and an HMG-CoA reductase inhibitor atorvastatin (cholesterol lowering agent). The amlodipine component of Syncard inhibits the transmembrane influx of calcium ions into vascular smooth muscle and cardiac muscle; it has a greater effect on vascular smooth muscle than on cardiac muscle. Amlodipine is a peripheral vasodilator that acts directly on vascular smooth muscle to cause a reduction in peripheral vascular resistance and reduction in blood pressure. The atorvastatin component of Syncard is an inhibitor of 3-hydroxy-3-methyl-glutaryl-coenzyme A (HMG-CoA) reductase. This enzyme catalyzes the conversion of HMG-CoA to mevalonate, an early and rate-limiting step in cholesterol biosynthesis. Syncard (amlodipine and atorvastatin) is indicated in patients for whom treatment with both amlodipine and atorvastatin is appropriate. Atorvastatin is indicated as an adjunct to diet to reduce elevated total-C, LDL-C, apo B, and triglycerides (TG) levels and to increase HDL-C in patients with primary hypercholesterolemia (heterozygous familial and nonfamilial) and mixed dyslipidemia; as an adjunct to diet for the treatment of patients with elevated serum triglycerides (TG) levels; for the treatment of patients with primary dysbetalipoproteinemia who do not respond adequately to diet; to reduce total-C and LDL-C in patients with homozygous familial hypercholesterolemia as an adjunct to other lipid-lowering treatments (e.g. LDL apheresis) or if such treatments are unavailable. Prior to initiating therapy with atorvastatin, secondary cause for hypercholesterolemia (e.g. poorly controlled diabetes mellitus, hypothyroidism, nephritic syndrome, dysproteinemia, obstructive liver disease, other drug therapy, and alcoholism) should be identified and treated. Amlodipine is indicated for the patients with mild to moderate hypertension (alone or in combination with other antihypertensives), the treatment of chronic stable and vasospastic angina, Raynaud's disease. Syncard may be substituted for its individually titrated components. Patients may be given the equivalent dose of Syncard or a dose of Syncard with increased amounts of amlodipine, atorvastatin or both for additional antianginal effects, blood pressure lowering or lipid lowering effect. Syncard may be used to provide additional therapy for patients already on one of its components. As initial therapy for one indication and continuation of treatment of the other, the recommended starting dose of Syncard should be selected based on the continuation of the component being used and the recommended starting dose for the added monotherapy. Syncard may be used to initiate treatment in patients with hyperlipidemia and either hypertension or angina. The recommended starting dose of Syncard should be based on the appropriate combination of recommendations for the monotherapies. The maximum dose of the amlodipine component of Syncard is 10 mg once daily. The maximum dose of the atorvastatin component of Syncard is 80 mg once daily. In general, treatment with amlodipine and atorvastatin combination is well tolerated. Some common side effects include headache, dizziness, tiredness, sleepiness, stomach pain, nausea, stomach upset, diarrhea, edema, flushing, arrhythmia, palpitation, muscle and joint pain etc. Before instituting therapy with atorvastatin, an attempt should be made to control hypercholesterolemia with appropriate diet, exercise, and weight reduction in obese patients, and to treat other underlying medical problems. Information for Patients: Patients should be advised to report promptly unexplained muscle pain, tenderness, or weakness, particularly if accompanied by malaise or fever. Care should be taken in patients with renal failure, impaired hepatic function, and heart failure as amlodipine may deteriorate the conditions. use in pregnant women clearly outweighs potential benefits. Combination of amlodipine and atorvastatin, which includes atorvastatin, should be administered to women of childbearing age only when such patients are highly unlikely to conceive and have been informed of the potential hazards. Lactation: Adequate human data are not available in case of lactation. Use in children: There have been no studies conducted to determine the safety or effectiveness of combination of amlodipine and atorvastatin in pediatric populations.